The Capitol region’s premiere holiday book event is back for the 41st year! 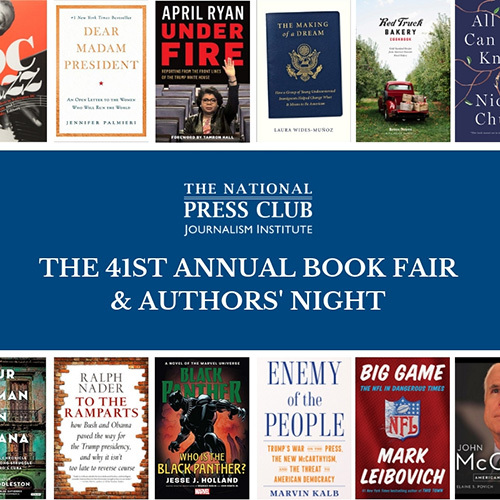 The National Press Club Journalism Institute is once again partnering with landmark local book seller Politics & Prose for a night of pols, pundits and prose. Authors will be on hand to talk to their fans and sign books at this most exciting literary event. Patrons can browse for books at the Club’s headquarters from 5:30 to 8:30 p.m. Tickets are $5 for NPC and Politics & Prose members; $10 public. Tickets will be sold online and at the door. The Book Fair is a fundraiser for The National Press Club Journalism Institute, a 501(c)3 charitable organization, which advances journalistic practice by equipping professionals with the skills and competence to innovate, leveraging emerging trends, recognizing leaders and innovators, mentoring the next generation of journalism and communications professionals, and advocating for a free press. **Please note**: No outside books or other author & book paraphernalia are allowed into the Fair. All books must be purchased onsite.